Apple Crisp – An eggless and super quick dessert! I had a couple of apples left over and I had made my Upside Down Apple Cake way too many times! I decided to try and look apple crumble recipes, apple pie recipes and apple cake recipes. I did try to make an apple pie a few weeks ago and while it wasn’t a disaster, trust me, it is a LOT of work. My pie unfortunately wasn’t very pretty. But, the crust and the taste of the pie, on the whole, were pretty good! But that’s another story. So with making a pie out of the list, I thought I would make something new and something different. Honestly, I had never heard of apple crisp, much less tried it. But the recipe was so simple and I had all the ingredients at home, I decided to give it a go! In a large mixing bowl, toss the apple slices, sugar, 1 tablespoon of flour, ground cinnamon and ground nutmeg. Arrange the apple-cinnamon mix in a 9 x 13 inch pan. In another bowl, combine the oats, flour, sugar, baking powder, baking soda, butter and rum flavoring. Mix until all the ingredients are just combined. Crumble the mixture over the apple slices. Bake at 350 degrees Fahrenheit or 175 degrees Celsius for 45 minutes. There is way too much sugar in this for me! I will be reducing the amount of sugar in the apple mixture to about 3/4 of a cup and in the crumble mixture to half. I highly recommend grinding the sugar in both the apple mixture and the crumble mixture. The sugars we get in India are very granulated and don’t melt well. You will end up sugar crystals in your mouth otherwise! 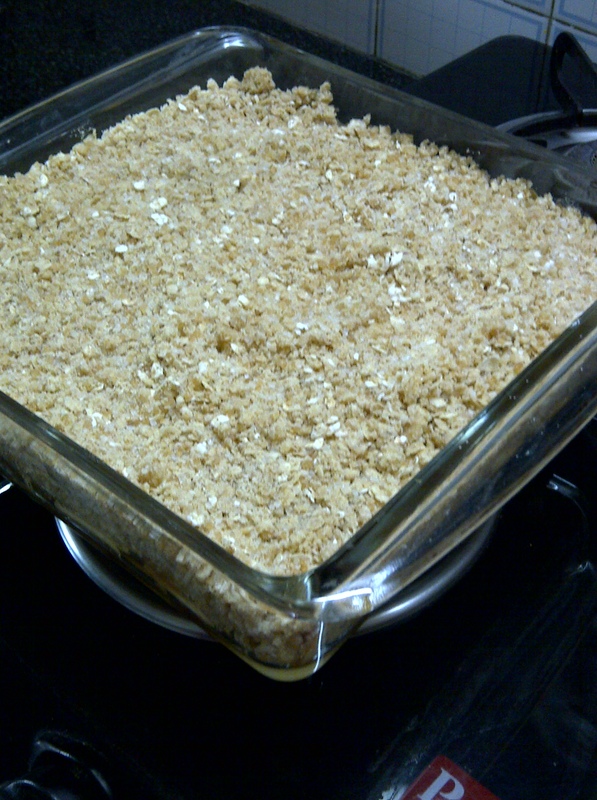 I sprinkled about 1 tablespoon of water over the crumble mixture halfway through the baking. Next time I’ll add it before I put it in the oven. Other than that, everything else was perfect to my taste. Here is what it looks like. 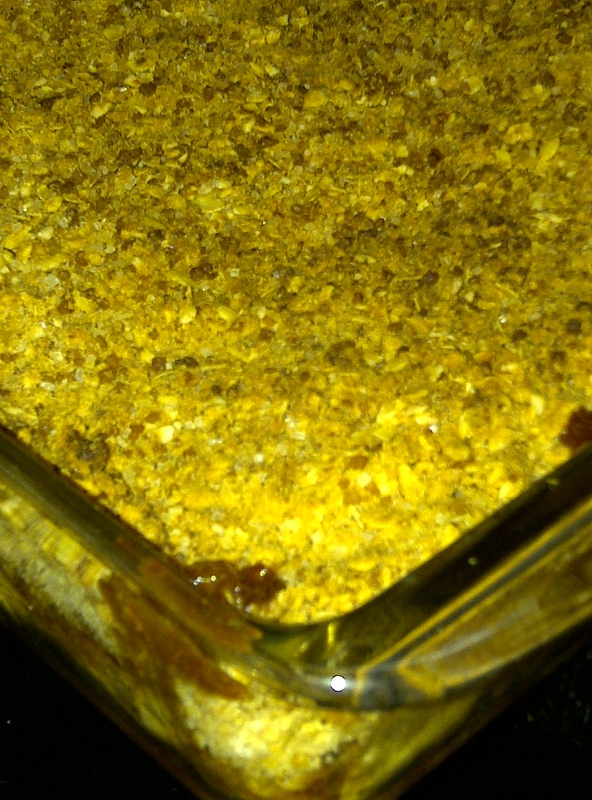 My favorite part of the crumble is that little super caramelized bit in the corner. It was yummmyyyy! Although I didn’t eat this with any ice cream, I highly recommend a scoop of vanilla ice cream with this. This is served best hot out of the oven but I think it tasted very nice after warming it in the oven too. Time to test this out with a bunch of people. I’ll let you know if it is a crowd pleaser or not!